We explore how illustration can transform a brand. Many brands choose to use illustration to do at least some of the talking for them, and if it’s true that an image speaks a thousand words, it’s easy to see why. Whether through content, style, implicit narrative or (likely) all three, an image can communicate what copy and typography often can’t, at once setting out a mood, tone of voice, target audience and attitude in a succinct visual. The idea of using illustration not just in a campaign, but as a core part of a brand’s visual identity is perhaps less common than it once was, and seems more aligned to certain sectors than others. Luxury food packaging design, for instance, especially on seasonal ranges: think high-end Christmas chocolate boxes. Or craft beer, a sector that’s seemingly indefatigable when it comes to both new variants and breweries. So what can illustration do that type, photography and copy alone can’t? For one, it shows a uniqueness, and in the right hands, it delivers on-shelf standout like few other approaches can. There’s far less chance, for instance, of a brand commissioning the same illustrator, style and image as there is of it using a similar typeface or colourway. Broadly speaking, a brand commissioning illustration also subtly communicates a level of thought and attention. In a similar way to brands working with bespoke, hand-drawn typography, even digitally created illustration hints at a person behind a brand. This helps build its story and tells us that there’s more to the product than just ‘buy me’. 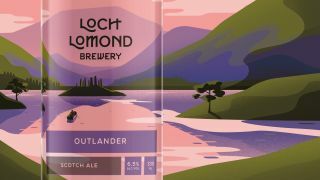 Thirst Craft is a Glasgow-based branding and design agency specialising in the drinks sector, whose portfolio boasts no shortage of richly illustrated designs – including the design for Loch Lomond Brewery used as the headline image for this article. According to creative director Matt Burns, it’s little surprise that the craft beer sector in particular has latched onto illustration as the perfect conduit for communicating a brand’s attitude and uniqueness. Hired Guns Creative is an agency based in British Columbia, Canada which, like Thirst Craft, has chosen to specialise in solely creating designs for alcohol, with most of its work across the craft beer sector and the majority of that work relying on illustration in one form or another. So why is craft beer such a rich font of illustrated packaging? For craft beer in particular, brands are selling an attitude as much as a liquid: “A lot of people in that space really try to align themselves with counterculture through their brand, and illustration is a great way to do that. You can design things for the craft beer guys that major beer or spirit brands would be too scared to do,” says Miltenberger. Somewhat unusually, Hired Guns chooses to create all its illustration in-house, mostly by creative director Richard Hatter. When a brand commissions illustration work, it’s not only a way of augmenting or creating a more cohesive brand world or message, it sends out a signal that it cares about its product, and the people that are buying it. A distinctive, characterful illustration is a symbol of uniqueness and distinction, immediately elevating it above nondescript system fonts or less ownable colour palettes. One of the reasons we’ve recently seen a wave of illustration that hints at care, craft and heritage is the fact that so many brands are celebrating landmarks. Their 100th or 150th anniversary is a perfect chance to put their flag back in the ground, and show a world full of shiny start-ups that they’ve been in it for the long haul; they’re reliable, an institution. At the forefront of Design Bridge’s recent work for Hellmann’s Mayonnaise, for instance, was stripping the aesthetic away from synthetic-leaning imagery to usher in a new, softer, watercolour-like, hand-drawn style of illustration. “It feels like more love has been put into it,” says Templeman. That sense of illustration as a succinct and easily manipulated conduit for a brand’s message extends into what it says about the brand itself – again, what’s “inherent in a drawing is artistry and craft in a way that’s harder to communicate in other ways,” says Lightfoot. A few years back, the typical way for an agency to find the right illustrator for a project would have been through submitted physical portfolios or using agencies and organisations such as the AOI. Nowadays, it’s more a mix of good old-fashioned ‘who you know’ and trawling through online portfolios and social media, most notably Instagram, and for Together Design, sometimes Pinterest too. For Burns, finding the best illustrator for the project is “more gut instinct than anything else,” and he warns against the temptation to simply hire the person who’s available at the right time, at the right price – especially when up against tighter deadlines and smaller product budgets. Of course, as Burns hints, you can’t always get what you want when it comes to your dream commission. You have to take into account budget, availability, and the opinions of any other stakeholders who might have a say in the final look and feel. But what makes a person great to work with, should they fit all of those more pragmatic criteria? For Amos, the best sort of relationship is “a little bit of a ping-pong match,” and Lightfoot agrees that it’s vital to find someone willing to collaborate, and work through potentially numerous iterations with the designers. The key to that sort of working relationship is both clarity and flexibility: setting out a clear brief, but being willing and open to listen to new ideas and seeing an illustrator not as a gun for hire, but a crucial cog in the bigger creative machine. Of course, as with any other design communication tool – be it copy, typography, photography, pattern or colour – designers working with global brands have to do some careful research into any unexpected signifiers that might say something they don’t want to say in other countries. When Design Bridge worked with Timorous Beasties on a set of highly illustrative packaging for Fortnum & Mason, for instance, the team soon discovered that moths are seen as unlucky for certain cultures; and had to take care with the shape and colouration of the butterflies that appeared in the work. As we’ve seen, illustration and craft beer are superbly comfortable bedfellows, and many food brands, too, use illustrative imagery to convey their message and create on-pack details. So are there any sectors where illustration wouldn’t work? This article was originally published in Computer Arts, the world's best-selling design magazine. Buy issue 279 or subscribe here.